CaniSource dehydrated raw dog food. The benefits of RAW with the convenience of a kibble. Made in Canada with only ingredients approved for human consumption. The web server used by Canisource.ca is located near the city of Chicago, USA and is run by SingleHop. 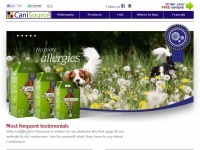 The website Canisource.ca has a own web server. The web server only runs this website.